Yimiton's Blog: 24 year old man pierced through head by 6ft pole miraculously survives. 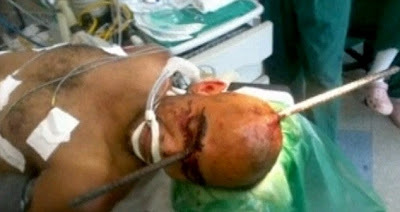 24 year old man pierced through head by 6ft pole miraculously survives. Miracles still happen, that's the only explanation I have for this very fortunate 24-year-old construction worker who survived after a 6-foot metal bar fell from above and pierced his head. 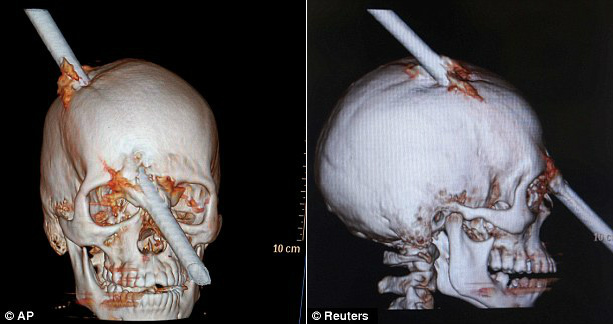 Luiz Alexandre Essinger, chief of staff at Rio de Janeiro's Miguel Couto Hospital, said doctors successfully withdrew the iron bar from Eduardo Leite's skull during a five-hour surgery. The bar fell from the fifth floor of a building under construction, went through Leite's hard hat, entered the back of his skull and exited between his eyes, Essinger said, adding: 'It really was a miracle' that Leite survived. Leite was conscious when he arrived at the hospital and narrated what had happened. He was lucid and showed no negative consequences after the operation. What a lucky break! He sure cheated death. Geez. That guy really cheat on death.